Summer is here and that means it’s time for family road trips! 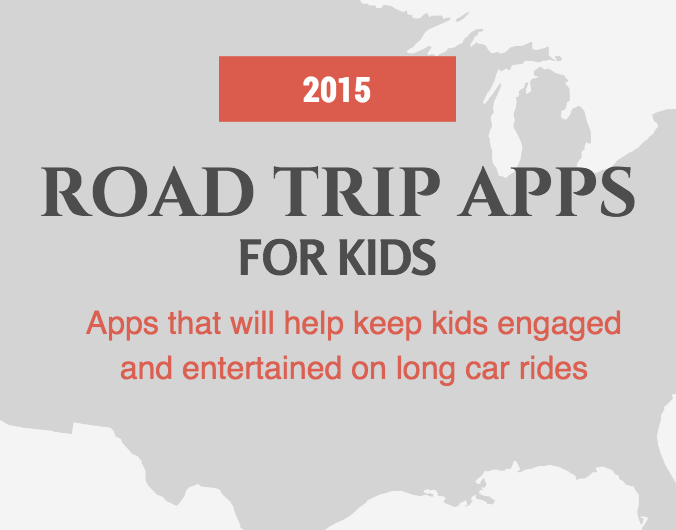 We have put together a list of apps that will help keep kids engaged and entertained on long trips. Sago Mini Road Trip is a free play app with lots of friends, interactive activities, and magical destinations for children to explore. In this app players take control to drive, fly, and explore various places on their own virtual road trip. Roxies a-MAZE-ing Vacation is a fun search and find game that takes players on a virtual road trip through various towns and across a variety of screens. Unique, fun, and perfect for long road trips with the family. State Bingo and Road Trip USA is an educational app with lots of geography questions and puzzlers that provides players a chance to learn while they play. It includes over 600 questions, 3 difficulty levels, and fun illustrations and maps, players can enjoy as they go on their own family road trips. Roadtrip-Bingo is a more traditional Bingo game using road signs, colors, airlines, vehicles, logos, and other things you might see on the road to create a fun game to keep children busy on long road trips. This app offers a simple concept with a nostalgic feel for children of all ages. Berenstain Bears Too Much Car Trip is a great storybook app with a road trip theme that offers voice record, text highlighting and narration options that kids will love. Smart Fish: Frequent Flyer is designed to help kids get ready to take a trip and offers step-by-step tutorials to help players get ready for their trip. Loaded with 13 landmarks, 20 suitcase designs, and 12 cross-cultural avatars, players are going to love this road trip themed app. Bogga Vacation offers everything kids love about road trips in the summer including, building sand castles, packing for fun adventures, treasure hunting and more. Fun, easy to play, and great for children of all ages.